Did I mention that it's Valentine's Day? This weekend I put the finishing touches on the table, and with the help of my friend Jeff I was able to get it installed in the dining room on Sunday. It was an exquisite moment, securing the top and seeing things in their final form for the first time. 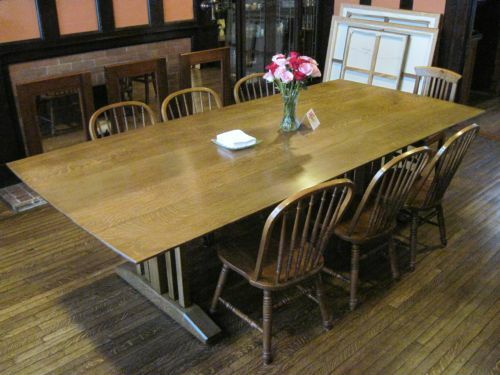 This table had existed only in my imagination for years. Even as the pieces took shape during the past two months, the final synthesis retained its sense of mystery. It is one of the wonders of making objects in the world, that not all things can be anticipated. In this case the surprises were pleasant. 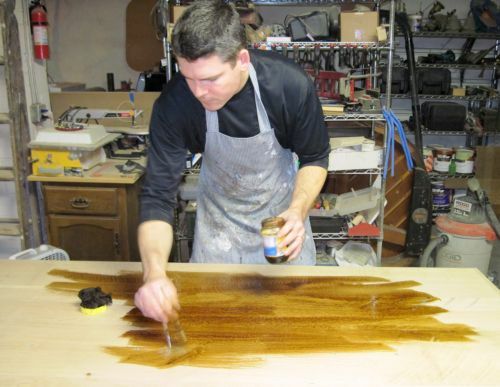 I used water-based stain (my home-made walnut stain) and water-borne polyurethane for the finish, allowing me to work safely and effectively indoors during the cold weather. Although the manufacturer warned against the use of steel wool between coats (to avoid rust spots from the dust, I assume), I went ahead and rubbed out the final coat with good results. I’ll let the finish shrink back for a while before I decide whether or not to use paste wax for a final coat. Applying the home-made walnut stain, fast and furious-- I've now added an HVLP gun to my "need" list. 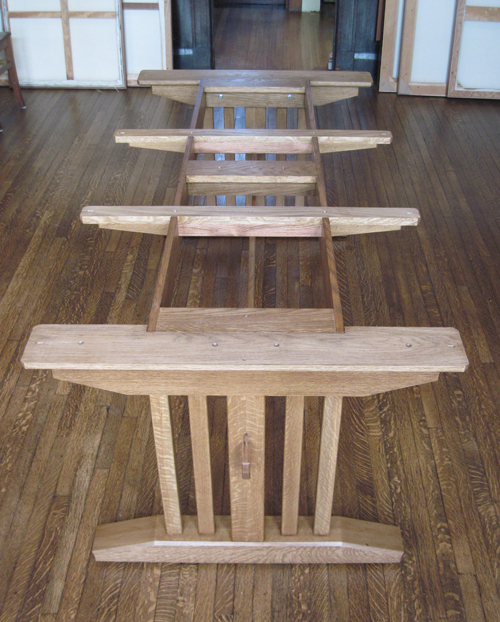 Table base assembly, which breaks down into six component parts (not including the pins for the through-tenons). 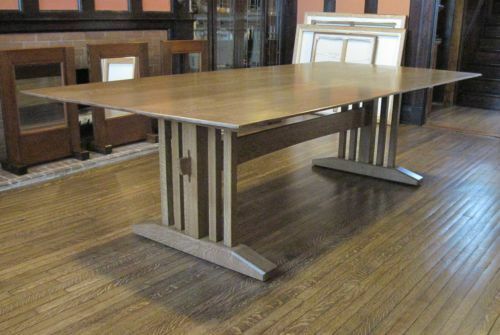 The curve on the bottom of the central stretcher becomes evident when juxtaposed with the edge of the table top. 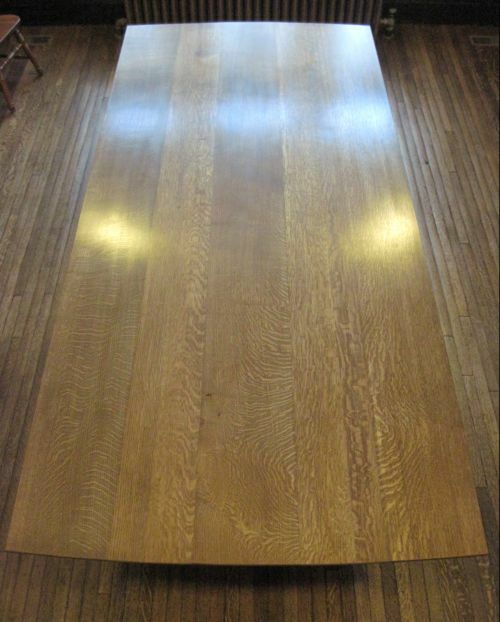 The quarter-sawn oak has a rich assortment of rays, and the wide boards simultaneously harmonize with and distance themselves from the floor. The upper edge of the top has a slight chamfer, and the lower edge is undercut at a 15 degree angle to take away some of the visual weight. The actual weight is another matter-- it takes two people to move the top, which is about 7/8" thick. 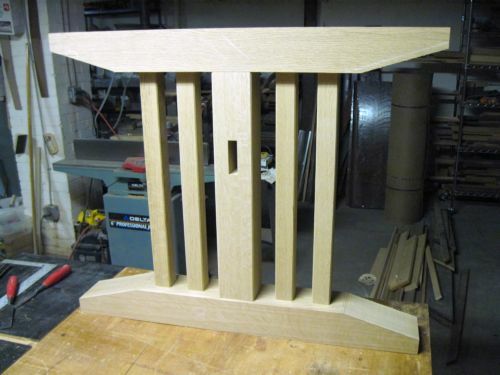 This entry was posted in Uncategorized and tagged pedestal base, quarter, quarter-sawn oak, through tenon, walnut stain, water-based polyurethane on February 14, 2011 by johnsarra. 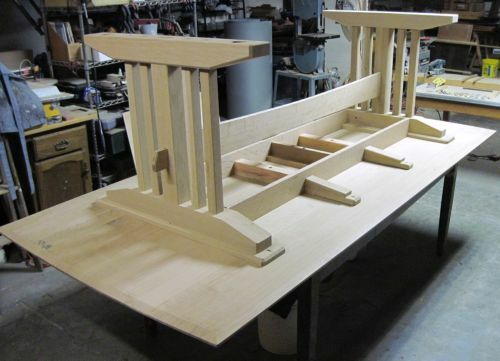 Pedestal base top and bottom blanks, exploded view. I mirrored dado cuts to create the mortises. All parts in place-- I made the central stretcher today, which has a soft curve along its bottom edge (the top edge in the photo) and a through-tenon at each end. 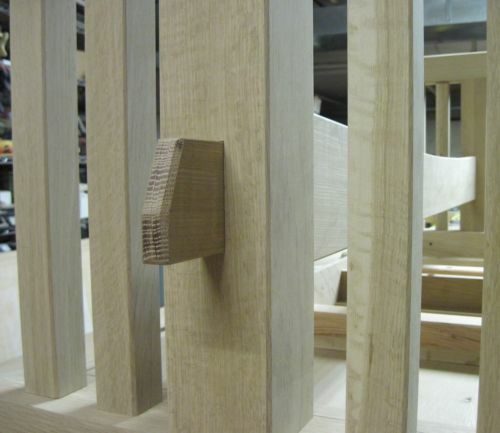 Detail of the through-tenon. 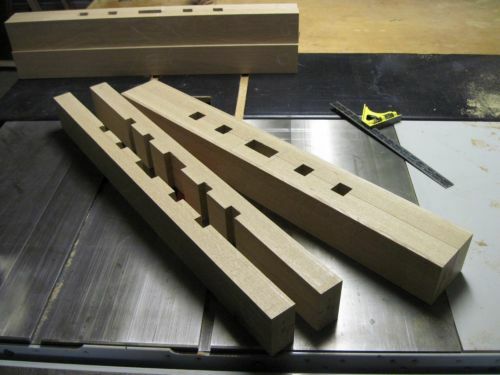 It will have a maple pin that runs from top to bottom, securing it in place. 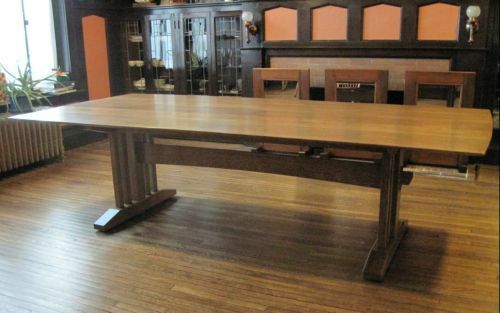 This entry was posted in custom furniture and tagged dining table, pedestal base, pin, stretcher, through tenon on February 1, 2011 by johnsarra.